2017-02-24 Well, the "new" underquilt is finished, at least I'm finished adding down/feathers to it. The untouched Costco Packable Down Throw weighed 15.5 oz in its stuff sack. My modified one weighs 20.06 oz. The original measured 56x69 inches. My modified one measures 56x48 inches. I removed stitches in the long direction so that I ended up with 11 tubes 5 inches wide and 56 inches long. The removed fabric weighed 2 ounces so I effectively added 6.5 oz of filling. The loft is about 3 inches. I have not tested it yet so really don't know what I've gained except some experience which may or may not be useful! Lessons learned? I'll probably not do this again. Not that it was so painful, but it was very time consuming and I don't know whether the end result will be worth it. It probably still won't be a fully stand alone under quilt below about 35 degrees. Also, the thrift store jacked had a 60% feather, 40% down mixture. Not sure how significant that is. The good news is, I did it! 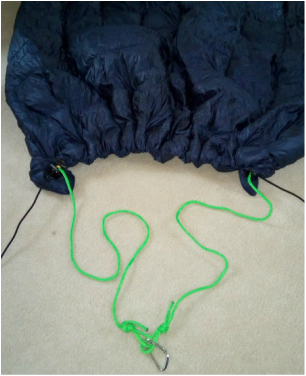 2017-02-18 After "freezing" the other night I started thinking about and playing around with my DIY Costco Packable Down Throw underquilt again. (Look below for previous work on this.) 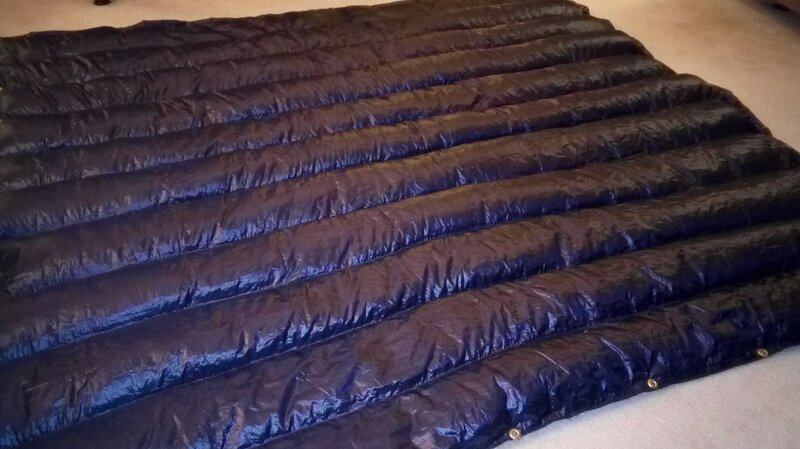 At a local thrift store I found a nice 80% down filled jacket to replace another one I had and began wondering about moving fill from the replaced coat to my underquilt. Yesterday I decided to remove all the cross stitching from the throw. Following a tip I saw online (snip the "straight through" thread rather than the looped thread which allows you to remove maybe a foot or more of seam with one pull), I was able to remove the seams pretty quickly. I also got to thinking about a 3/4 length UQ rather than a full length one. Checking a number of vendors of shorter UQs I found that about 48 inches wide by 55 or so inches long is in the ballpark. Next was figuring out how to remove three full length tubes from the Costco throw, transferring the down from them to the remaining tubes. After trying a couple different approaches I managed to transfer the down from those three edge tubes to the three middle tubes and then cut off those three tubes. I ended up using the funnel described below. Now I have to think through how to harvest down from that jacket for the remaining tubes. I can tell already it will be a mess, but it should also be an interesting undertaking! And it may take a month to get all the stray down out of my nose! 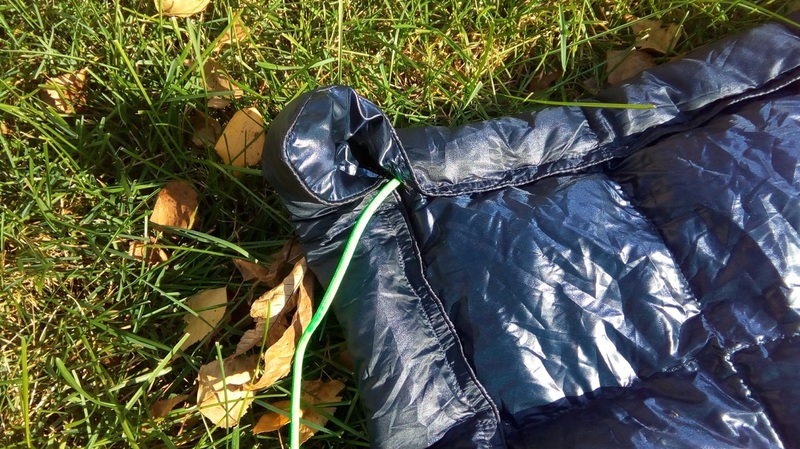 The picture below shows my final setup to capture down (and feathers) from both the edge tubes of the throw and from the old jacket I found at a local thrift store. It is a piece of poster board rolled and taped to form a funnel. The top is roughly the width of the tube of down in the jacket and the bottom is about 2-1/2 inches across and fits nicely into a slit in the end of a tube in the costco throw. At first I put a paper towel over the bottom to keep the down from coming out but discovered the down stays in without it so that made the process even simpler. My setup to remove down from an old jacket. The painter tape keeps the top in place on the edge of the table while the bottom sits on the garage floor. 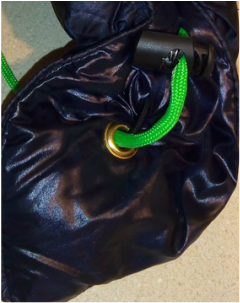 To remove the down from the jacket I carefully cut the zipper and end of each chamber from the jacket, cut a small slit in the opposite end of the chamber and then with the open end over the funnel worked the down out using the piece of pvc pipe. Fortunately most of the down and feathers were heavier than air and there was no breeze so it fell into the funnel fairly willingly. My kind wife graciously sewed a hem across the end of the throw to seal the tubes I had slit to insert the down. She also sewed a new side seam where I had removed three empty tubes after transferring their down to the three center tubes in the modified throw. An amazingly small amount of down and feathers escaped the process. But you would NOT want to do this in the house! The funnel inserted into a slit in the end of a tube in the down throw which is held in place by the coffee can (filled with salt for my sidewalk) and the jug of windshield de-icer. I use the piece of pvc pipe to poke it from the funnel into the tube in the throw. A simple but elegant solution! 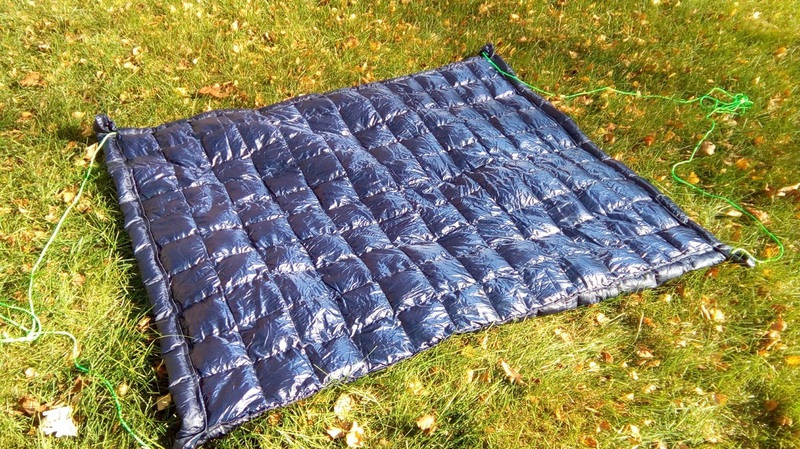 2016-10-23 Yesterday my wife turned a Packable Down Throw sold at Costco into an underquilt. The down is stitched into roughly 4" squares so she flipped one edge over and sowed the outside seam to the 4" stitching that formed the first 4" row. The result is a two inch channel on all four sides, open at the corners. I threaded fifteen feet of 550 nylon Paracord through the long sides to act as the primary suspension. then I'll add shock cord to the ends which can be adjusted to snug them up against the bottom of the hammock. On one end of each long-side paracord I tied a fixed loop which is attached to a carabiner that in turn clips onto the hammock suspension at the end of the hammock. At the opposite end I did the same thing only with an adjustable loop so I can experiment with how long the combined paracord and shock cord need to be for my setup. At some point I may change that to a fixed loop as well. 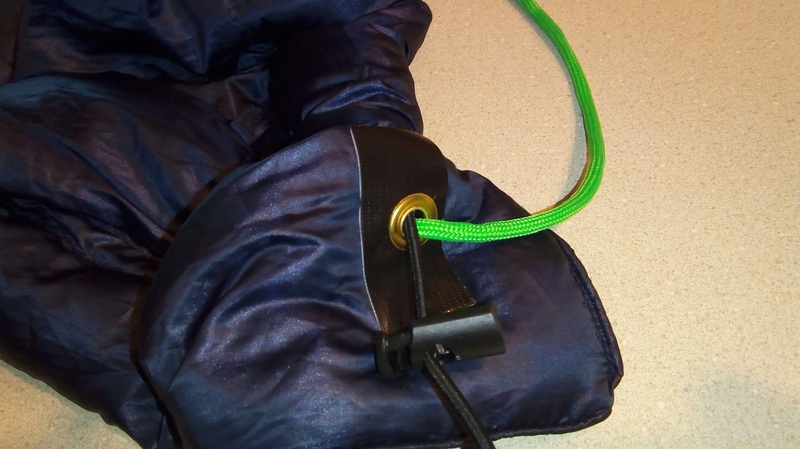 The cord locks on the inside of each corner grommet allow me to move the underquilt toward the head or foot end of the hammock and then lock it in place. On the ends I have a length of shock cord that goes from side to side and through the grommet on the two respective corners. Outside the grommets I put cord locks on the shock cord and finally tied a not. This allows me to gather the underquilt up against the hammock. Green paracord for suspension and black shockcord gathers the ends. Cord lock on the paracord on the internal side of the underquilt. Corner detail of the underquilt. It is all untested at this stage but I'm optimistic that it will work for moderately cold weather. If not, minimal damage has been done to the throw so it can be used as a throw.